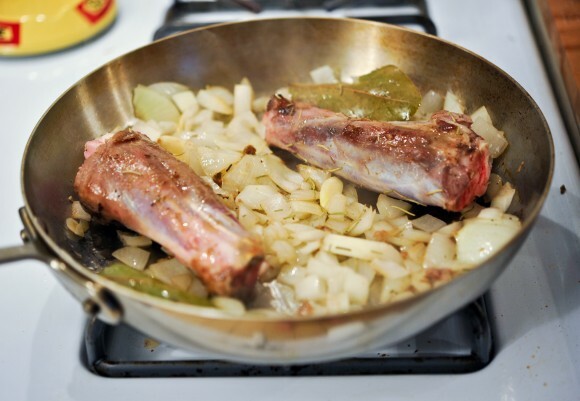 To make this dish, you’ll want two lamb shanks. These were actually quite small, but you could easily get larger ones if you are feeding more people. I drizzled them with a little bit of olive oil, seasoned them in salt and pepper, and seared them off in my deep skillet in a little bit of tallow (rendered beef fat, a gift from the awesome folks at M.F. Dulock). A dutch oven would work well for this, but my dearly beloved Le Creuset 7 1/4 Qt. is currently injured, and I haven’t been able to send it back to get a replacement. While doing this, I turned the oven to 300 F to preheat. After browning the shanks, I added the chopped onions and a few cloves of garlic to the pan. I sprinkled on some rosemary and added a few Turkish bay leaves my mom smuggled back from a tree in Istanbul. 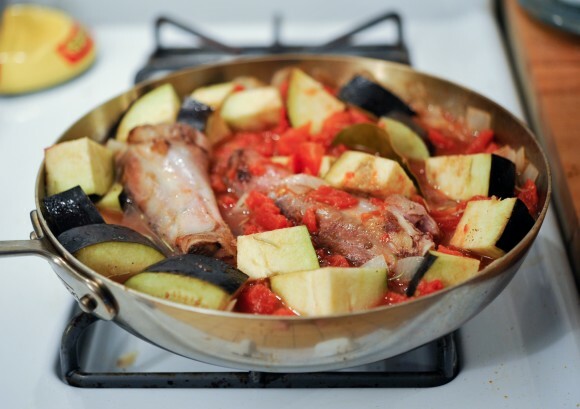 I then chopped the anchovies, added them to the pot, added tomato paste, an eggplant chopped into large cubes, and some water to come halfway up the shanks. You could easily use some red wine and stock here if you had some. The anchovies are quite salty, but I tasted the broth and gave it a final seasoning. 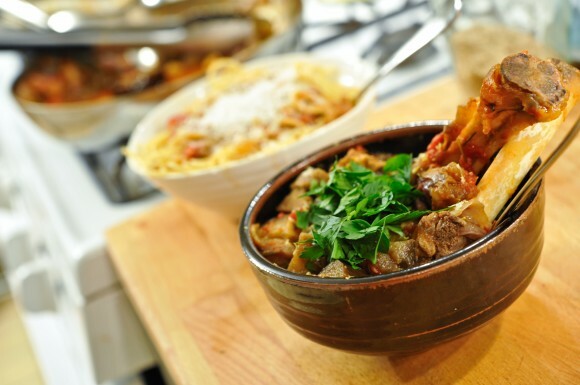 I served Devon’s off the bone over some pasta with parmigiano, and my bowl with a double portion of eggplant, and a grating of lemon zest and sprinkle of parsley. Preheat the oven to 300 F. Season the shanks with salt an pepper, and brown them in a dutch over or deep skillet in some olive oil or good fat (I used tallow). When the shanks have browned, add the onions and garlic. Nestle in the rosemary and bay leaves. Chop the anchovy fillets and add them to the pan, then add the tomato paste and gentle stir. 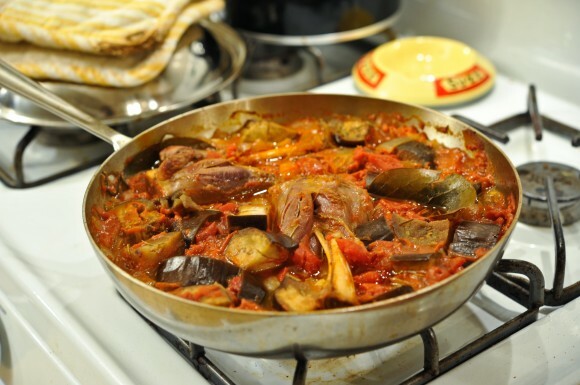 Add the chopped eggplant, pour over the diced tomatoes and the water to reach about half way up the shanks. Bring to a simmer. Once simmering, put the lid on, and bake in the oven for two hours, turning the shanks half way through. Serve topped with lemon zest and parsley. 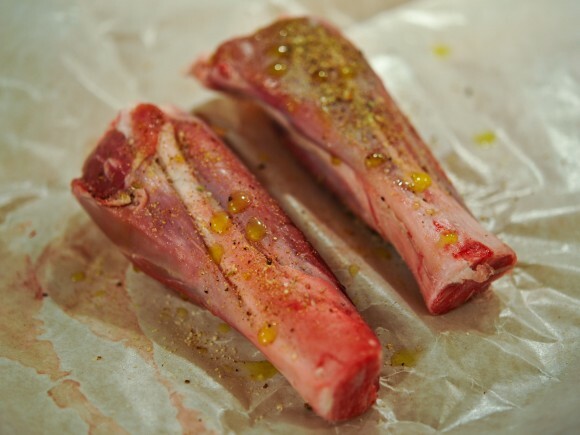 Or, remove the meat from the bone, and serve over pasta with a grating of parmigiano. Leftovers taste particularly good on day two with a few poached eggs. This is a lovely recipe, but you should know that you’ve used foreshanks which are far smaller and less meaty than hindshanks. I generally use the foreshanks in stocks and soups such as harrira.